Learn how to create a custom frame with a custom phrase that you can use in so many awesome ways! In the Layers panel, click on the Create a New Layer icon. Get the Rectangular Marquee tool. In the Tool Options, click on the New Selection icon. Set the Feather to 0 px and the Aspect to Fixed Size. (PS: Set the Style to Fixed Size.) Enter a Width of 6 inches and a Height of 4 inches. 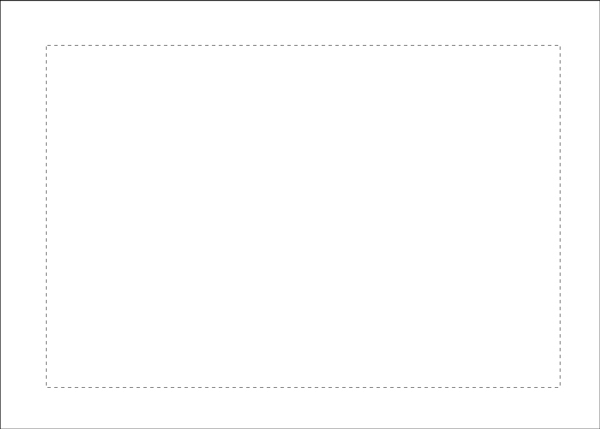 On the document, click and drag to position the selection so that it’s entirely on the document and roughly centered. In the dialog box, enter 8 px for the Width, set the Location to Inside, and set the Blending Mode to Normal with an Opacitiy of 100%. Click OK. In the Tool Options, choose a font and size. Click on the Center Text Alignment icon. I’m using the font Fonesia with a size of 18 pts. On the document, click once in the center just below the top of the stroke frame and type the phrase you wish to use. 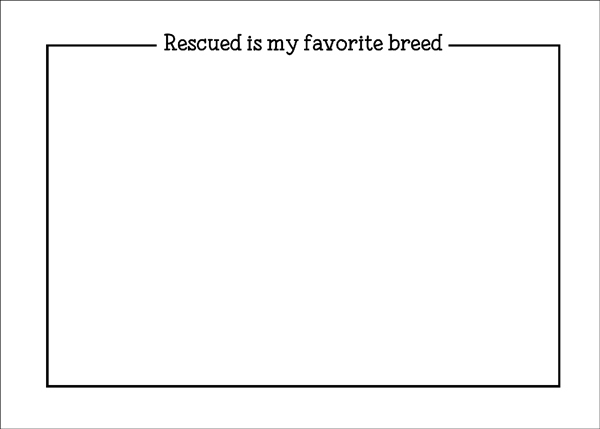 I’m using the phrase “Rescued is my favorite breed.” Click the checkmark to commit. In the Layers panel, hold down the Shift key and click on the stroke layer. Now both the type layer and the stroke layer should be active. In the Layers panel, click once on the type layer so it’s the only active layer. 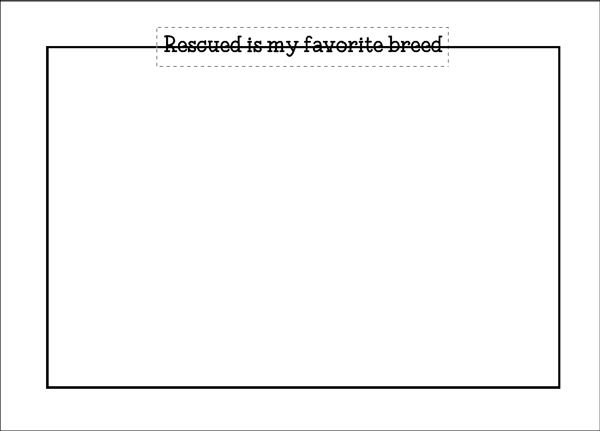 On the document, click and drag an outline around your text. To reposition while dragging, press and hold the Space bar. TIP: Try to center the selection outline around the title. In the Layers panel, click on the stroke layer to activate it. Press the Backspace key (Mac: Delete key) to remove the selected portion of the stroke frame. In the Layers panel, hold down the Shift key and click on the type layer. Now both the type layer and the stroke layer should be active. Note: This frame is not something you can stretch. If you need a smaller or larger sized frame, make sure you adjust the size at the very beginning of this tutorial for your project’s needs. Finally used this technique on a couple photos, Jenifer. Turned out great! My heart goes out to you for choosing the subject for your sample. Bless you! 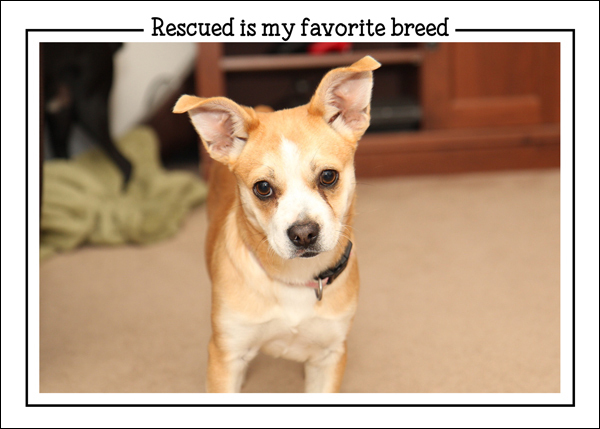 I am the photographer for our local animal rescue & adoption organization. 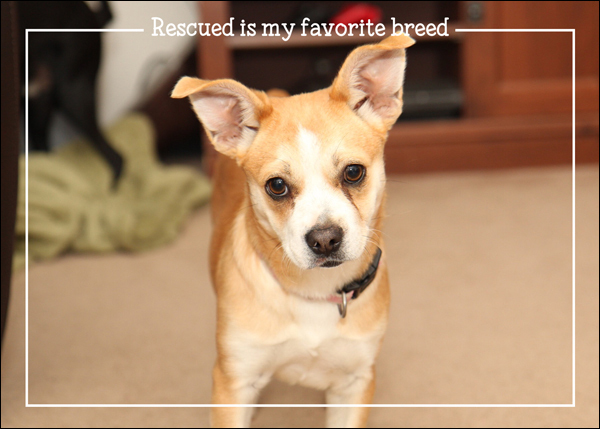 My heart swells when I see dogs rescued & adopted. I have 5 of them myself! 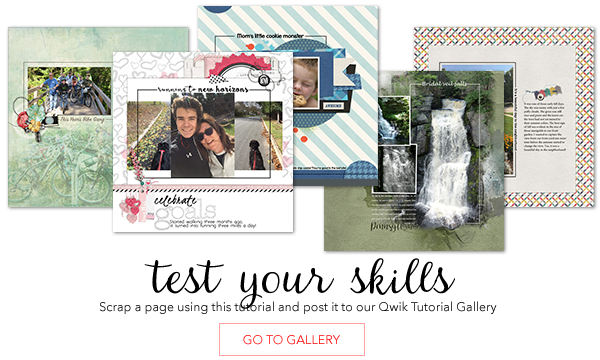 I posted it in the Gallery’s Qwik Tutorial area and in our Design Beautiful Pages Stacking Design area. Now, after all that rambling…just want to thank you, Jenifer. Made me do a lot of thinking and utilizing the techniques I’ve learned here! Merci;..je suis en train d’essayer et impossible d’utiliser le rectangle de selection…l’ellipse marche mais pas le rectangle….qu’ai-je fait ??? j’ai PSE15 depuis avril….votre tuto est très facile …je ne comprends pas …??? ?